Spicy Red Beans and Rice Recipe is a family favorite – it is quick, easy and economical. Plus, it is healthy and uses chicken broth rather than chicken bullion cubes. One of my goals for this year is to be more budget conscience, especially where our food budget is concerned. It is really a balance between budget and healthy eating. Let’s face it, healthy eating sometimes costs more! But, I would rather pay the food bill than a doctor’s bill! So, I am always looking for an easy meal that is also economical. That is exactly what Spicy Red Beans and Rice is – quick, easy and economical! Being in the middle of pruning the vineyard (well, we are really just getting started! ), I can easily make this Spicy Red Beans and Rice Recipe the night before, refrigerate and reheat it for lunch the next day. We have our biggest meal of the day at lunchtime and after working all morning in the vineyard, by 12:30 pm everyone is hungry – I mean reeeaaaalllly hungry! So, I need something to fill these guys up! 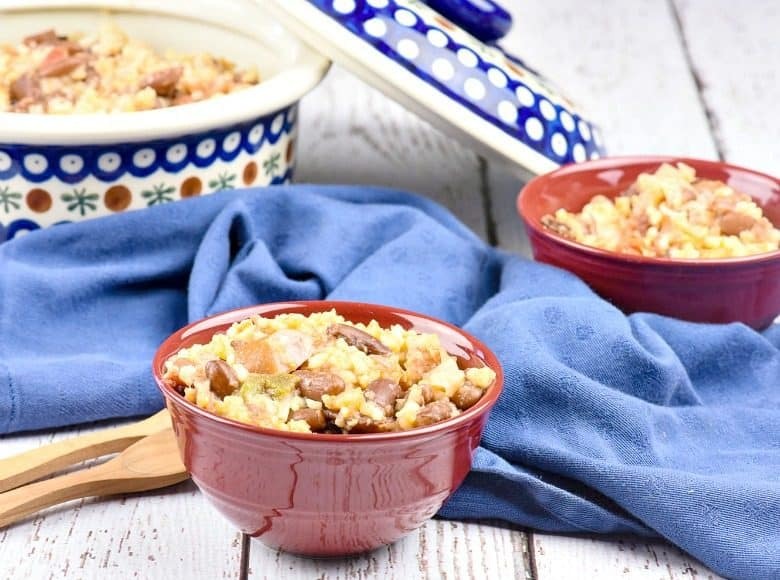 Spicy Red Beans And Rice Is A Family Favorite! Spicy Red Beans and Rice recipe is one of those recipes that has been in my recipe basket for years. It is an old newspaper clipping from I don’t remember where! It is taped to a recipe card, yellowed, marked with changes and still a family favorite. The original recipe called for water and bullion cubes but what an improvement in taste and nutrition by using the real stuff – homemade chicken broth! If your family is like mine, you might want to add more sausage – they actually separate out pieces of sausage and count to see who received the most! I would like to say that this is limited to the younger children but, even the older children, although they may not pick them out to count, notice how many pieces of sausage they get! Heaven forbid if a sibling (especially a younger one) got more than they did. Of course, this is all done in a loving fun way! 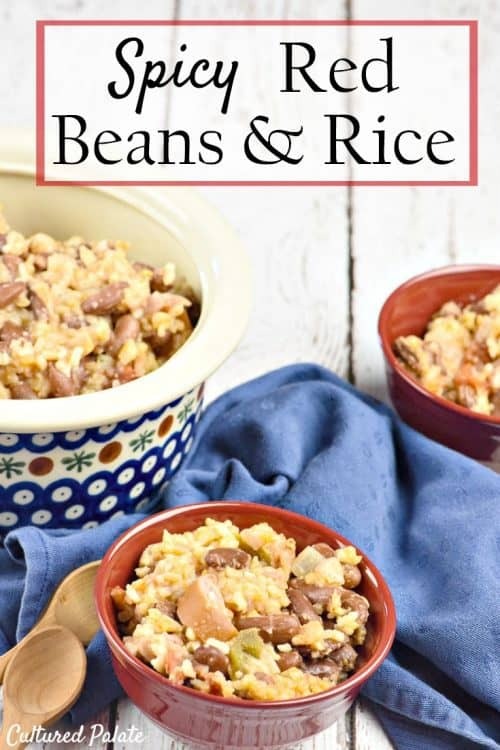 If you’ve tried this Spicy Red Beans and Rice Recipe or any other recipe on Cultured Palate please take a minute to rate the recipe and leave a comment letting me know how you liked it. I love hearing from you! You can also FOLLOW ME on PINTEREST, FACEBOOK, INSTAGRAM, YouTube and TWITTER. Affordable meals don't have to be bland. Give this one a try! Soak kidney beans covered in water overnight. In the morning, cook kidney beans until tender. In a large boiler, bring chicken broth to a boil. Stir in rice. When the broth returns to a boil, add the remaining ingredients except for the tomatoes and salsa. Return the mixture to a boil and turn the heat down to simmer. Cover and simmer for 35 min or until the rice is tender and most of the liquid is absorbed. Turn off the heat. Add the tomatoes and salsa - mix well. This recipe is easily doubled, tripled and more. Multiply the amounts of all ingredients equally except the salsa - add more and taste as it can become to spicy even with mild salsa. Thanks for taking the time to comment, Jamie – my family really enjoys them! I made this recipe last week and it was a big hit, not only that, it was so easy. I did substitute black beans for kidney since they were what I had on hand. Thanks so much. I really enjoy reading your posts. Your descriptions of the vineyards, the pruning and especially your new pruning machine are fascinating. Of course, it certainly brings the parables of Jesus to life. My son is very interested as he is the wine manager of Southside Espresso, a small shop serving in-house roasted coffee, wine and handcrafted beer and ale, in the Montrose area of Houston. I believe he is planning to follow your blog for future wine purchases. Thanks, Joy! I love hearing that people like my recipes. And, I appreciate your encouragement. Printed this recipe, I’m excited to try it! Tina, be sure and let me know how you like it! This looks and sounds so delicious I had a chuckle that your kids count the sausages because I secretly do that too, haha! Are the nutrition facts per serving? Thank you! Laura, yes they are per serving. This is one of my staple recipes because not only is it delicious, it is nutritious and economical – It satisfies my farm boys with their BIG farm boy appetites! 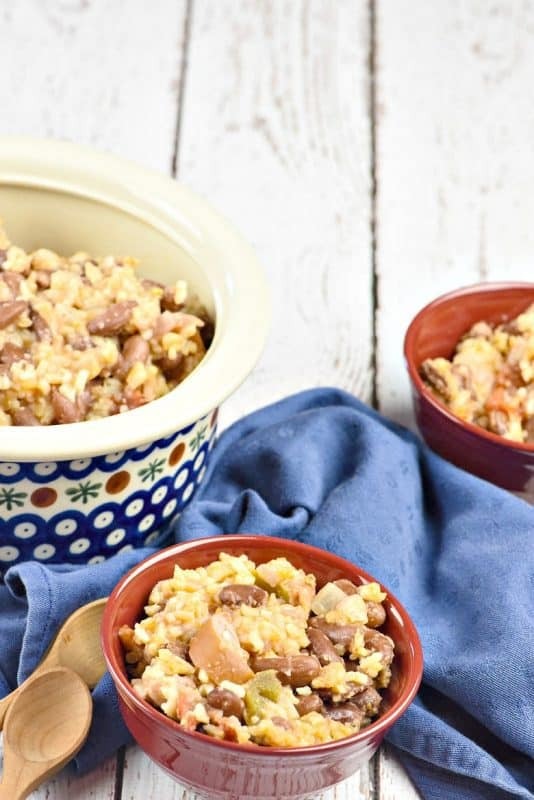 This is the most amazing recipe of red beans and rice! I cook it often now! I’m so excited that i printed and tried this recipe!!! Tina, so glad you enjoyed it – this is one recipe that is on my monthly meal plan! Okay so this recipe got me into a lot of trouble. Let me explain, I prepared the recipe and invited my mother in law over. She was sitting next to me and I took a bite. It was so good I slid down into my seat and let my head rest against the back of the chair as i chewed very slow, savoring every second. Then i sat up and was overwhelmed by the flavor. I said to my husband this is far better than any of the bean and rice recipes your mother has ever cooked isn’t it! ….then the fight started…. totally worth it! just saying!